The axilla is an irregularly shaped pyramidal area formed by muscles and bones of the shoulder and the lateral surface of the thoracic wall. The apex or inlet opens directly into the lower portion of the neck. The skin of the 'armpit' forms the floor. All major structures that pass between the neck and arm pass through the axilla. The cubital fossa is a triangularly shaped depression formed by muscles anterior to the elbow joint. The brachial artery and the median nerve pass from the arm to the forearm through this fossa. The carpal tunnel is the gateway to the palm of the hand. Its posterior, lateral, and medial walls form an arch, which is made up of small carpal bones in the proximal region of the hand. A thick band of connective tissue, the flexor retinaculum, spans the distance between each side of the arch and forms the anterior wall of the tunnel. The median nerve and all the long flexor tendons passing from the forearm to the digits of the hand pass through the carpal tunnel. 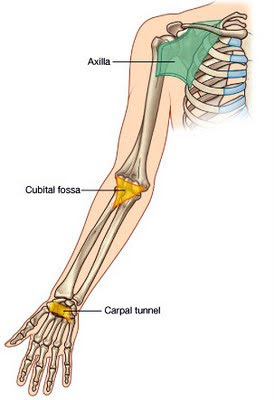 That was something good information on carpel tunnel. My uncle is getting Carpal Tunnel Surgery In Phoenix this month that's why am collecting information for that. Thanks for sharing. Keep exploring.